Want to see it larger? Beautiful color and composition. Love the use of negative space. So pretty. Love the low horizon in this. Very nice. Lovely shot David. Wonderful layers beautifully shot. Is that the Mt. Rainier? Thank you kindly for not only visiting, but for commenting as well! This is gorgeous. Great perspective, lovely, soft lighting and the full moon high in the sky — wonderful combination. Nice capture, Dave. Has that quiet winter feel to it. 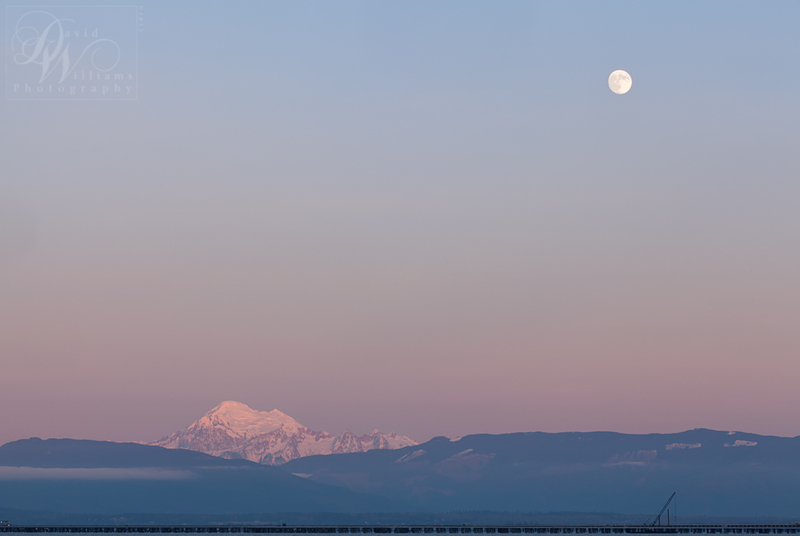 I’m amazed by how well you were able to catch both the moon and mountain top at the horizon. Love the soft colors on the horizon. Was this taken at night with a long shutter speed?